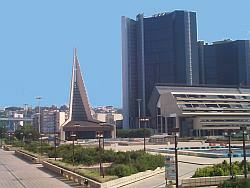 The new Naples Civic Center, the Centro Direzionale, is visible from almost any point in Naples or from the bay. Depending on who is doing the talking, you will hear various descriptions: a futuristic satellite city of gleaming towers; a white elephant; a sore thumb. It is —again, depending on the source— just what the city needs, or else an unacceptable break with the urban history of the city. 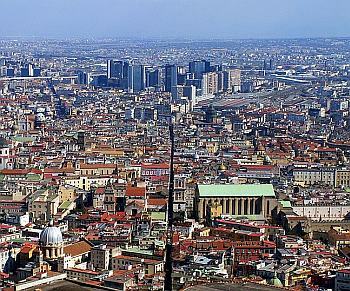 Naples has a long history of episodes of explosive urban development. The Spanish were responsible for the first such episode in modern times when they broke down the old city walls and built modern (for the 1600s) blocks of buildings, creating what today are still called "The Spanish Quarters". The Bourbons did more of the same in the 1700s and 1800s. Then came the rebuilding of Naples, the risanamento, decades (1885-1915) of such drastic construction that half the city had to find another place to live. The Fascists built big in the 1920s & 30s and the "economic miracle" of the 1950s & 60s was responsible for the overbuilding evident wherever one looks at the Posillipo or Vomero sections of Naples these days. Thus we come to the 1964 plan to create a new Civic Center in a relatively undeveloped part of town, the east. This was to be the first effort in Naples at true skyscraper technology. The Centro Direzionale follows the 1982 design of prominent Japanese architect, Kenzo Tange, whose work includes the urban plan for Tokyo in 1960, the design for the grounds of the Tokyo Olympics of 1964, and, in Italy, the designs for the Bologne Civic Center and Fair Grounds in 1975. 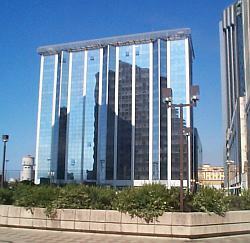 The Centro Direzionale is more than one square kilometer set in the Poggioreale section of the city near the central train station. That part of Naples is, bluntly, the worst part of town; the Center, itself, is right next door to the large Poggioreale prison, an institution built almost a century ago for 1100 inmates but today holding twice that number. The location, thus, presents some problems with the over-all perception of the Civic Center, quite apart from aesthetic considerations of architecture. Occupancy, at least so far, is much lower than what one might expect for a plan that called for the displacement, sooner or later, of municipal office space from their current locations in the traditional center of town to the new and gleaming towers, plus relocation of banks and businesses and the creation of a new resident community—a "neighborhood." *update 2014: Joint Forces Command, formerly AFSOUTH, has moved out of Bagnoli to new premises farther north. The layout of the Centro Direzionale is impressive. There are 18 "islands" of buildings, with high-rises up to 100 meters. There are office buildings as well as residential flats. It is, essentially, a small city: a pedestrian zone at ground level with shops, restaurants and hotels that are easily accessible. There is a mammoth underground parking facility with escalators running up right into the middle of the pedestrian concourse, an area adorned with fountains, benches, greenery and even a church (photo, top). The Centro Direzionale will eventually have its own underground train station; construction of the new metropolitana line is inching its way (and if I could say "millimetering," believe me, I would) in that direction. All in all, the main problem is one of perception. In spite of the modern trend towards supermarkets, malls, and all–in–one shopping, most Neapolitans still live with the idea of the local neighborhood. They do not willingly go out of town to do their business and do not easily accept the idea of a new, built "neighborhood." That is something that grows over time; you don't just build it.